Sceaftesige Garrison is the Berkshire & Buckinghamshire sub-group of the international living history organisation Regia Anglorum. We re-enact forgotten skirmishes and famous battles from the time of the birth of Ænglaland, or England. 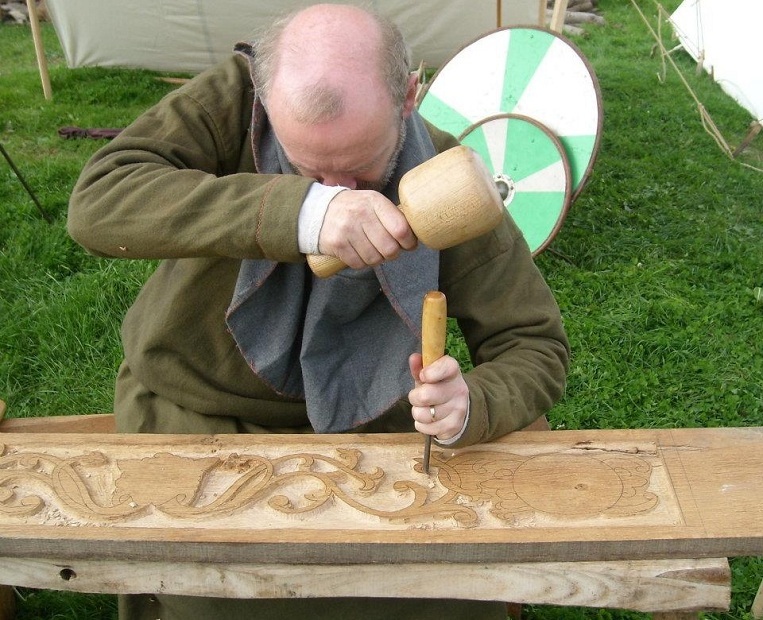 But re-creating the lives of our early mediaeval ancestors isn't only about axe-on-shield action, the vast majority of their lives would be spent cooking, sewing, carving and other daily tasks. As a living history group, many members choose to explore these less glamorous activities and uncover unknown talents. The majority of Sceaftesige's shows will at some point have two shieldwalls advance towards each other in mortal combat. Depending on when and where the show is set, this could be Pict against Viking, Welsh against Saxon, Norman against English or any combinations therein. We portray each side with the utmost accuracy, with authenticity officers ensuring that matériel shown is in keeping with the best historical knowledge. But our primary concern is safety. Fielding 150 fully armed men may appear dangerous, but seldom will we accumulate as many injuries as the average Rugby game. 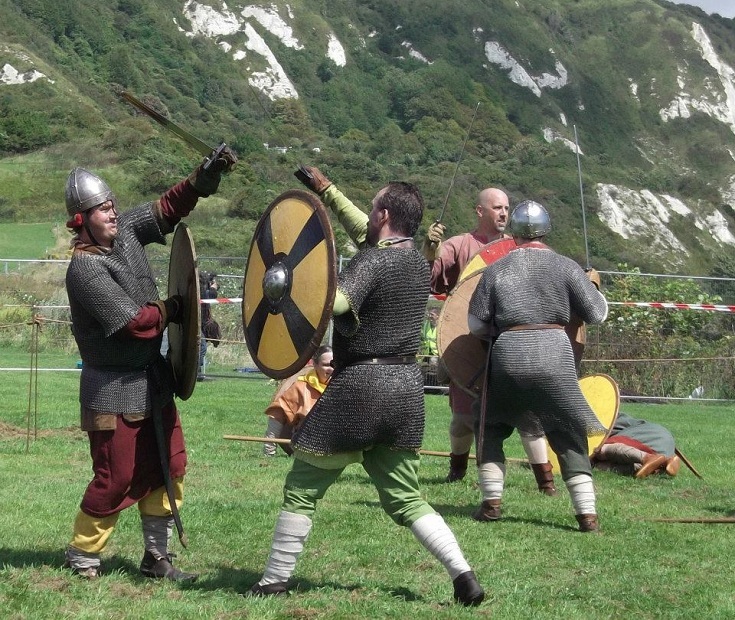 The combat is unchoreographed and competitive: if we land more blows on them than they do on us, then we will probably win (unless it is a re-enactment of a major well-known battle — it is unlikely that the English will ever win Hastings, for example). Most of Sceaftesige's shows will include a Living History Exhibition (an LHE), which is our chance to show to the public the quieter side of early mediaeval life. This can include things like woodcarving, quern grinding, wool spinning, lighting fires and making jewelry. These activities never fail to draw a crowd, sometimes from other re-enactors. Whilst it is true that few Regia members opt for a life of tilling fields and the other more monotonous tasks of Dark Age existence, these LHEs are a superb way to learn about a great many facts of the lives of our ancestors. We take authenticity very seriously, with many of us taking the time to produce items of clothing and equipment in the same way as was done in the 10th-century — many of the things we work on in front of the public are the same as we would be working on over weekends. 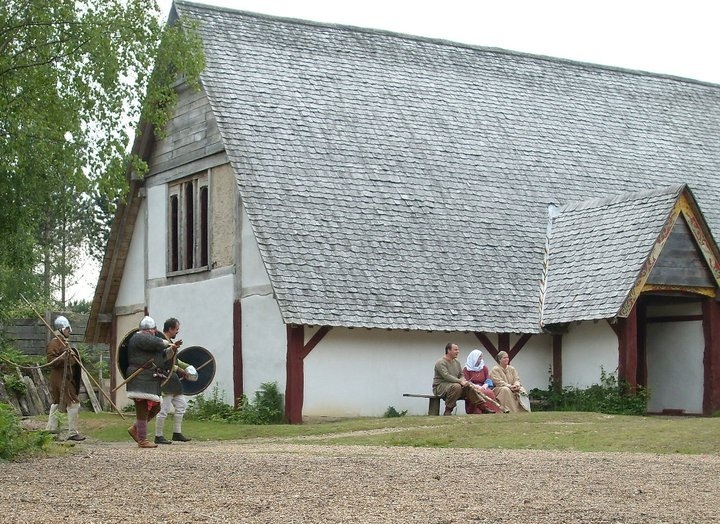 Unique to Regia Anglorum is the Wychurst Project, the building of a 10th-century Anglo-Saxon settlement in Kent. The land is owned freehold by Regia and once a month members journey down to work on the hall and the buildings which surround it. Sceaftesige are very involved in this project, the co-ordinator of Wychurst is a member of our group. Unfortunately, we can't rely on daily slave labour as the 10th-century Thegns could have done, but we can fall back on 21st-century technology and power tools to compensate. Through this project, many members have learnt new skills completely unrelated to Dark Age re-enactment. This work goes well rewarded, for throughout the year there are public and private events at the longhall, where we can immerse ourselves in our creation and celebrate as our forefathers would have done in aeons gone by, or re-create a Viking raid on a defenceless Saxon settlement. Sceaftesige Garrison was formed as a group in 1991 by the merging of the Berkshire and Buckinghamshire groups. The name "Sceaftesige" means Sceafa's Isle — now known as Sashes Isle which is on the River Thames. Sceaftesige also referred to a medium-sized burh, which was built on Sashes Isle in King Ælfred's time (associated with 1000 hides of land and therefore with a potential garrison of 1000 men), although this burh was short-lived and was superseded by the nearby town of Cookham by the end of the millennium (Domesday Book entry pictured). The island may have been named after Sceafa — a legendary King in the early midst of English royal tradition. Archaeological research on the history of the Sashes Island fort is ongoing, the University of London's Extra-Mural Archaeological Society (EMAS) has an ongoing Sashes Island project, which is seeking to find out more about the real Sceaftesige. Information about this project can be found here. Additionally the Minas Tirith Ltd Archaeological Survey has produced a report on Saxon fortifications in the Cookham area (i.e. the Sceaftesige fort) which can be accessed here. Sceaftesige's first leader, Dave Telford, also embarked on a little research regarding the history of the fort, his article can be read here. Below is the reference to Sceaftesige in the Anglo-Saxon document listing many fortifications, the Burghal Hidage. 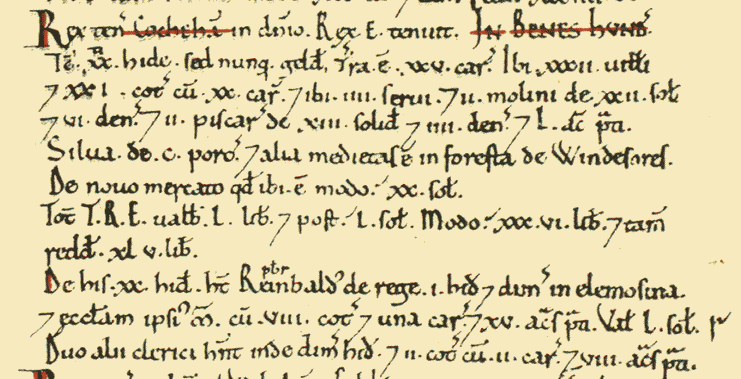 Unlike the Latin Domesday Book, it is written in Anglo-Saxon English (or Ænglisc) and the Sceaftesige entry reads and to Sceaftesige, 1000 hides of land. The name Sceaftesige is a two-syllable word, pronounced Shyaft-see, which is better understood when you realise that SC represented the SH sound in Ænglisc, that the EA is more of a "YA" than an "EE", and that the letter G had a somewhat muted pronunciation, such as the G in "night". In the early days Sceaftesige was a purely military group, occasionally fielding as many warriors on the field of battle as all other groups of Regia Anglorum combined. But in the first few years of the 21st-century, the group's evolution saw a predominant swing towards the civilian aspects of the society.